The man was Eric Moussambani Malonga, later nicknamed “Eric the Eel”. Moussambani is from Equatorial Guinea in Africa and only managed to get into the Olympics at all because of a wildcard drawing system put in place by the International Olympic Committee, designed to try to encourage developing countries to participate in various Olympic events. Thanks to this drawing, Equatorial Guinea decided to send a swim team to the 2000 Olympics in Sydney, Australia. They put out an advertisement on the radio a few months before the Games to try to get people to come and tryout for the country’s new national swim team which would be going to the Olympics. Those who wished to tryout were to show up at the Hotel Ureca in Malabo, Equatorial Guinea. At the time, this hotel was the only place in the country that had a swimming pool (only 12 meters long). Two people showed up, one woman, Paula Barila Bolopa (who was a grocery store cashier at the time), and one man, Eric Moussambani. Because of the lack of competition, the only thing the two had to do to get on the team was to demonstrate that they could in fact swim. My preparation was very poor… I was training by myself, in the river and the sea. 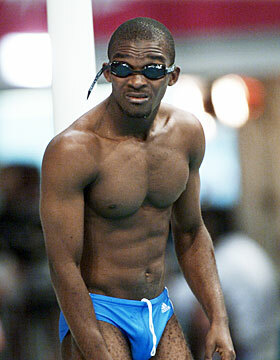 My country did not have a competition swimming pool, and I was only training at the weekends, for two hours at a time. I didn’t have any experience in crawl, breaststroke, or butterfly. I didn’t know how to swim competitively. The Olympic Games was something unknown for me. I was just happy that I was going to travel abroad and represent my country. It was new for me. It was very far from Africa. Just three months after hearing the advertisement and then getting selected to represent his country, Moussambani was on his way to the Olympics. He took a somewhat roundabout flight to Libreville (Gabon), then to Paris, then to Hong Kong, and finally to Sydney, a trip that took nearly three days to complete. Along with accommodations, he had £50 of spending money while at the games and an Equatorial Guinea flag for use in the opening ceremony. My training schedule there was with the American swimmers. I was going to the pool and watching them, how they trained and how they dived because I didn’t have any idea. I copied them. I had to know how to dive, how to move my legs, how to move my hands… I learned everything in Sydney. What makes Moussambani’s story even more compelling is that he would go on to win his heat in the 100m freestyle, albeit in a pretty unorthodox way. You see, at the time, he was to compete against just two other people in the qualifiers, Karim Bare from Niger and Farkhod Oripov from Tajikistan. Both of these two ended up getting disqualified for false starts, leaving just Moussambani, who at the time thought he had been disqualified, before it was explained to him that his competitors were the ones out and that he’d be swimming the heat alone in front of 17,000 spectators. The first 50 meters were OK, but in the second 50 meters I got a bit worried and thought I wasn’t going to make it… I felt that [it] was important [to finish] because I was representing my country… I remember that when I was swimming, I could hear the crowd, and that gave me strength to continue and complete the 100 meters, but I was already tired. It was my first time in an Olympic swimming pool. Certainly Moussambani exemplifies that sentiment. Since 2012 Moussambani has been the coach of the Equatorial Guinea swim team, when he’s not working his day job as an IT engineer. They actually have a real, competitive team now comprising 36 swimmers, so the Olympic wild card system paid off in that respect. They also have an Olympic size swimming pool to practice in now. Moussambani has gotten a lot better at competitive swimming. By 2004, he got his 100m free style time down to 57 seconds, which would have been good enough for him to qualify in the 2004 Olympics, but a visa mistake ended up costing him a trip to that year’s Games. Some have speculated the visa mishap was intentional in order to stop him from competing. The gist of it was that when he submitted his application, his passport photo was somehow lost by the Malabo officials processing it. Some highly placed government officials in his country had previously expressed anger at how he’d embarrassed their country in 2000 and were not enthusiastic about him going to the Athens games. Whatever the case, due to the loss of the photo, his application was denied. Moussambani’s current training routine for the 2016 Olympics is to wake up at 5am and run for 3 km. He then gets ready for work and spends 8am to 5pm there. On Tuesday, Thursday, Friday, and Saturday he heads down to the pool where he meets his team and trains from 6pm-10pm. The 100m freestyle gold medalist (Pieter Van den Hoogenband) in the 2000 Olympics finished with a time of 48.3 seconds, which was a new world record. The current world record for the men’s 100m freestyle (long course: 50m pool) is 46.91 seconds, set by Cesar Cielo of Brazil in the 2009 World Championships in Rome. The current Olympic record is 47.05 seconds, set by Eamon Sullivan of Australia in the 2008 games. Equatorial Guinea’s other swimmer in the 2000 Olympics, Paula Barilia Bolopa, also struggled to finish her heat, this time in the 50m freestyle, finishing with a time of 1:03.97. While it was a new record for the 50m freestyle for Equatorial Guinea, it was also, like Moussambani’s time, a new slowest time record in Olympic history for the 50m freestyle. 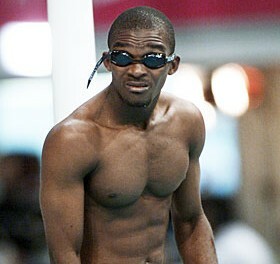 I remember seeing this guy swim in an olympic video after it was all over and thinking “That’s awesome”. He may not have been the best, but he sure gave it his all. The fact that he never gave up and has a significantly better time is even more amazing. Rogge is straight up wrong. Being in the Olympics gave him the Olympic spirit, and he is certainly a credit to his country.